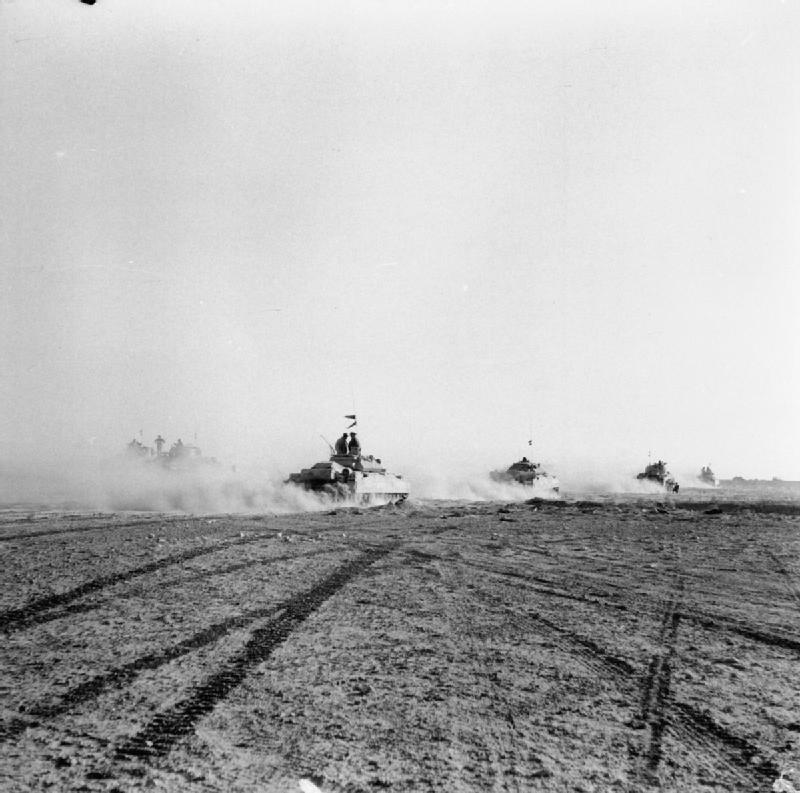 British tanks advancing under fire at the Second Battle of El Alamein during World War II. Prior to World War I, horse-mounted cavalry performed what is now the role of tanks; manoeuvring and breaking through enemy infantry to attack army lines of communication in the rear. The entry of machine guns on the battlefield, and the increased occupation of the flanks of armies, leading to closed fronts, made cavalry too vulnerable for this task. British Mark I tanks first went to action at the Somme, on September 15, 1916, but did not manage to break the deadlock of trench warfare. In the Battle of Cambrai (1917) British tanks were more successful, and broke a German trenchline system, the Hindenburg Line. The German Empire produced only a few tanks, late in the war. Twenty German A7V tanks were produced during the War, compared to almost 4,000 French and over 2,500 British tanks of various kinds. Nonetheless, World War I saw the first tank-versus-tank battle in military history, in April 1918 during the Second Battle of Villers-Bretonneux, when a group of three German A7V tanks engaged a group of three British Mark IV tanks. After the disastrous final German offensive; in the summer of 1918 the lack of Tanks on the German side, coupled with the Allied tactics that involved a combination of hundreds of their own tanks, cannon equipped (aka "males"), as also machine guns equipped ("females"), with rotating turrets (like the French Renault FT) or not (like the British tanks), greatly contributed to the success of 1918 Allied counter-offensives (as eg the Battles of Soissons and Amiens), which ended the stalemate imposed by trench warfare on the Western Front, and thus effectively ending the war. Following the First World War, the technical and doctrinal aspects of armoured warfare became more sophisticated and diverged into multiple schools of doctrinal thought. During the 1920s, various British and French commanders who had been associated with the development of the tank were involved in developing the new ideas. The significant split in philosophy can be said to be French and British in schools of thought. The French school proposed the armoured forces to be largely an infantry supporting arm, demanding heavily armoured tanks armed with infantry support guns, as well as 'cavalry' tanks operating en masse to break through the enemy defensive lines. Although seen as retrograding and reminiscent of WW1 tank use, it advocated a doctrine that included a desire to introduce an element of manoeuvre without expecting collapse of the enemy infantry's defence. The British school leaned more towards more mobile and lighter designs supported by equally mobile units of infantry, artillery and sappers to replace horse-mounted cavalry. These self-contained motorised detachments would depend on the tank only to provide a way to penetrate the main enemy defensive lines, and would seek to bring about defeat of the enemy by severing the lines of communication and supply as had been done during the previous century. In Britain Liddell Hart wrote extensively on tank warfare and the theories of Colonel Fuller. The British War Office sanctioned the creation of the Experimental Mechanised Force which was formed on May 1, 1927, under Colonel R. J. Collins. The units were entirely mobile and consisted of reconnaissance tankettes and armoured cars, a battalion of 48 Vickers medium tanks, a motorised machine gun battalion, a mechanised artillery regiment, which had one battery of fully tracked self-propelled guns capable of acting as conventional or anti-aircraft artillery (Birch guns), and a motorised company of field engineers. The unit carried out operations on Salisbury Plain and was observed by the other major nations, the United States, Germany, and the Soviet Union. Although its performance was recognised, it was disbanded in 1928. In the Soviet Union during the early 1930s Red Army and German officers collaborated in developing use of tanks based on 2nd generation vehicles using turreted main weapons, and experimenting with different chassis configurations and drive trains. One important acquisition for the Red Army turned out to be the purchase of a T3 chassis from an inspired US designer J.W. Christie which served as the basis of the Soviet BT series of fast tanks. The Red Army in particular was much influenced by the theoretical works of Marshal Tukhachevsky who advocated "large scale tank warfare" in the early 1930s His theories died with him with his execution in 1937, but were revived with General Georgy Zhukov's mass tank, artillery, and air attacks at the battles of Khalkhin Gol (Nomonhan) in 1939, during the Soviet's undeclared war with Japan. These tactics would be repeated on a larger scale a week later by the German army during their invasion of Poland in September 1939. This development led to the intent by the Red Army to form a massive tank force of thousands of vehicles. Concentration of force requires mobility to prevent the enemy detecting the point of attack in time to reinforce the section of the defence, and concentration of firepower to be effective in combat once concentrated. The tank embodies these two properties, and so constitutes the primary weapon in armoured warfare. The arrival of the German Afrika Korps under command of General der Infanterie Erwin Rommel highlighted the weaknesses of the British approach: the small number of infantry and artillery in each armoured division was sufficient when attacking the immobile and uncoordinated Italian troops, but against the highly mobile, well-coordinated German units, the undermanned Commonwealth formations were proving inadequate. Between 1941-42, the Allies struggled in armoured battles in the North African desert due to improper tactics; in particular, running armoured formations into opposing anti-tank positions; however, they achieved some notable successes at Crusader, 1st Alamein and under Montgomery finally achieved decisive victories, in particular at the Second Battle of El Alamein against even the mighty 8.8 cm flak guns. In the later years of the war, with the invasion of the European mainland, Allied Armies become effective armoured forces, but increasingly larger and more powerful German tanks, such as the Panther, Tiger and King Tiger easily outclassed most Allied tanks on a tactical level, with the Churchill & Cavalier/Cromwell being the closest match the British could offer. Nonetheless, the overwhelming numbers of Shermans combined with their average capabilities ensured Allied Victory. Later in World War II, the Germans were on the defensive. The Panther and heavy Tiger tanks had impressive firepower and armour in tank to tank battles. It could take four to five Shermans to knock out a single Tiger tank by manoeuvring to its weaker flank or rear armour. But the onslaught of Allied armour was much superior in numbers. Besides using tanks in dug-in positions, the Germans made use of older types by turning them into tank destroyers, basically turretless tanks with heavier guns and sometimes heavy armour plating. Though the U.S. had established the Tank Corps in WWI using French Renault FT (and Six Ton Model 1917 tanks, copies of Renault FTs) and British MK tanks, and some officers like Dwight D. Eisenhower and George S. Patton, Jr. emerged from that war initially as avid proponents of continuing and developing an American armored force, the rapid reduction of the forces and apathy and even antipathy towards funding and maintaining armed forces in the inter-war years led to relative stagnation of armored doctrine in the United States. Adna R. Chaffee, Jr., virtually alone, advocated for the future of armored warfare and the development of appropriate training, equipment and doctrine during the late 1920s through the 1930s. The United States Army had always regarded the French Army as the best army in Europe, and consequently the US Army frequently copied French uniforms (the US Civil War), airplanes, and armour (Renault FT tank). Only when France was rapidly overrun in 1940 did the US Army become "shocked" into re-thinking the influences by the perceived actions of German tanks in the 1939 Polish Campaign. Its Armored Combat Arm was not created until 1940 when The Armored Force was born on July 10, 1940, with the Headquarters, Armor Force and the Headquarters, I Armored Corps established at Fort Knox. On July 15, 1940, the 7th Cavalry Brigade (Mechanised) became the 1st Armored Division; the 7th Provisional Tank Brigade, an infantry tank unit at Fort Benning, became the 2nd Armored Division". The Tank Battalion was established at Fort Meade, Md., and a small Armored Force School was also established. The popular conception in the US was that tanks had been used boldly as part of a new system of war called Blitzkrieg. Under General Jacob L. Devers, Chief of the Armored Force, doctrine evolved into a combined arms operational force consisting of primarily infantry, artillery, and tanks with tanks being the major maneuver component. Under this doctrine, US tank crews of both armored divisions and GHQ tank battalions were taught to fight tanks in tank on tank engagements. Armored Force personnel during and after the war criticized the infantry for using the GHQ tank battalions assigned to infantry divisions strictly as infantry support. The US Combined Arms team included air support, artillery, engineers, and a tank component supplemented by the Tank Destroyer concept. The latter is most closely identified with the Chief of Army Ground Forces, General Leslie McNair. Having studied the early German successes McNair came under the belief that US forces would be faced with fast moving enemy forces who would seek to bypass, isolate and reduce US forces in a replay of the Fall of France. To counter the enemy blitzkrieg McNair sought to improve the organic anti-tank strength of the US infantry divisions by attaching towed AT guns and equipping the infantry with hand-held Bazookas. To stem the flood of marauding panzers, fast moving powerfully armed Tank destroyer battalions were created to be held back and used in the counterattack. It was believed that conventional tanks that could take on the enemy Panthers and Tigers toe to toe would not have the speed and mobility to avoid being flanked and bypassed and therefore would not have the chance to fight. It was also calculated that US interests would be better served by large numbers of reliable (battleworthiness) medium tanks rather than a smaller number of un-reliable heavy tanks. It was decided therefore to slow the production of the US heavy tank designs such as the M26 Pershing and concentrate resources on mass-producing the M4 Sherman and tank destroyers such as the M18 Hellcat. Since the Sherman medium tank would be inferior to the enemy heavy tanks they would have to avoid tank-vs-tank combat as much as possible, leaving enemy tanks to the tank destroyers. To be able get into position to counterattack, the tank destroyers had to be fast. To achieve the desired mobility and agility from the engines available the armor protection was sacrificed, a measure of protection coming from being nimble and hopefully from being able to knock out the enemy before they could get a shot in. Although they had guns of around about 76 mm, the tank destroyer units were issued with the ancestor of the modern Armour-piercing discarding sabot, rounds which made their guns much more powerful than a simple comparison of calibres would suggest. In 1939, the Japanese Army engaged Soviet armour at Nomonhan. During the three month long war, Japanese armour had shown their weakness against Soviet tanks; and the resulting Japanese defeat prompted a series of complaints by the Imperial Army to incorporate improvements in future Japanese armour. This is the primary reason IJA tanks were not as successful while being used with IJA tactics. The tank forces of the US Army consisted of the M2A4 and M3 Stuart light tanks up until 1941, although these vehicles were five years newer than the 1935 built Type 95's, the IJA and US light tanks were comparable to each other, and seemingly performed well for their respective forces during jungle combat operations; during their phase of WWII. In many conflicts, it was usual to see infantry riding on the back of tanks, ready to jump off and provide support when necessary. Unfortunately, the design of many modern tanks makes this a dangerous practice. The M1 Abrams, for example, has such hot exhaust gas that nearby infantry have to be careful where they stand. Tanks can also be very vulnerable to well aimed artillery; well-coordinated air support and counter-battery artillery units can help overcome this. Tanks rarely work alone; the usual minimum unit size is a platoon (platoon is the smallest US Army/Marine unit led by an officer, and a component of a company or troop) of four to five tanks. The tanks of the platoon work together providing mutual support: two might advance while covered by the others then stop and provide cover for the remainder to move ahead. Normally, multiple platoons coordinate with mechanized infantry and utilize their mobility and firepower to penetrate weak points in enemy lines. This is where the powerful engines, tracks and turrets come into play. The ability to rotate the turret by a full 360° allows coordinated movement within and between platoons, while defending against attacks from multiple directions and engaging troops and vehicles without stopping or slowing down. Although able to carry a number of different missiles and bombs (including anti-tank ordnance such as the AGM-65 Maverick), its main weapon is the 30 mm GAU-8/A Avenger Gatling gun which is capable of firing 3,900 depleted uranium armour-piercing rounds per minute (a popular belief is that the plane was actually built around the gun and not vice-versa). Capable of low-speed, low-altitude flight, the A-10 is itself an airborne armoured vehicle with a titanium enclosure about the pilot, an airframe that can survive direct hits from armour-piercing and high-explosive projectiles up to 23 mm and triple redundancy in its flight systems, with mechanical systems to back up double-redundant hydraulics. The Soviet equivalent is the SU-25. Similarly, a number of helicopter gunships have been designed mainly to engage enemy armoured vehicles. The AH-1Z Viper, AH-64 Apache, Denel AH-2 Rooivalk, Eurocopter Tiger, Ka-50 Black Shark, Mi-28 Havoc, A129 Mangusta and Westland Lynx are examples. Helicopters are very effective against armoured vehicles for many reasons. The AH-64D Longbow Apache, for example, is equipped with an improved sensor suite and weapon systems and the AN/APG-78 Longbow Fire Control Radar dome installed over the main rotor. Helicopters however have proved highly vulnerable to small arms ground fire, and so in American service, most missions that would have originally fallen under the domain of the attack helicopter are instead being executed by the much more heavily armoured A-10. ↑ "Israel unveils defense shield for Merkavas". UPI.com. 2010-04-06. http://www.upi.com/Business_News/Security-Industry/2010/04/06/Israel-unveils-defense-shield-for-Merkavas/UPI-97231270579381/. Retrieved 2011-12-28. ↑ "Trophy Active Protection System". Defense-update.com. http://defense-update.com/products/t/trophy.htm. Retrieved 2011-12-28. ↑ Maital, Shlomo. "Anti-tank missile defense system stops attack ... JPost - Defense". Jpost.com. http://www.jpost.com/Defense/Article.aspx?id=210366. Retrieved 2011-12-28. ↑ "125mm APERS And Special Rounds". Fofanov.armor.kiev.ua. http://fofanov.armor.kiev.ua/Tanks/ARM/apers/ammo.html. Retrieved 2011-12-28. Guderian, Heinz (2001) . Panzer Leader (Da Capo Press Reissue edition ed.). New York: Da Capo Press. ISBN 0-306-81101-4. Hofmann, George F. and Starry, Donn A., eds. "Camp Colt to Desert Storm: The History of U.S. Armored Forces." 1999; University Press of Kentucky. ISBM 0-8131-2130-2.
von Mellenthin, Major General F. W. (1971) . Panzer Battles: A Study of the Employment of Armor in the Second World War (First Ballantine Books Edition ed.). New York: Ballantine Books. ISBN 0-345-24440-0.